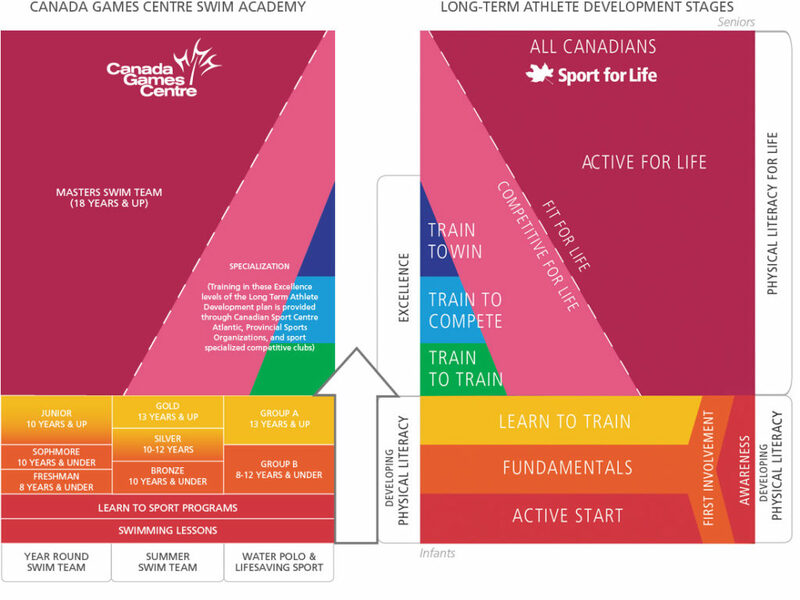 The Canada Games Centre Swim Academy (CGCSA) is a new approach to aquatic sports designed to develop the whole athlete and avoid pitfalls normally associated with over-training and early sport specialization. Each team with the CGCSA offers participants access to a variety of training opportunities, both in the water and on dry land, to help avoid injury and dropout while ultimately increasing overall enjoyment of physical activity for life. CGCSA is built on the foundation of sport research regarding child/youth sport development, physical literacy, fundamental movement skills and Long Term Athlete Development (LTAD) designed by Sport for Life (S4L) and supported by Sport Nova Scotia’s Get More From Sport. For more information on physical literacy and the stages of LTAD, visit our CGCSA Resources & Links page.